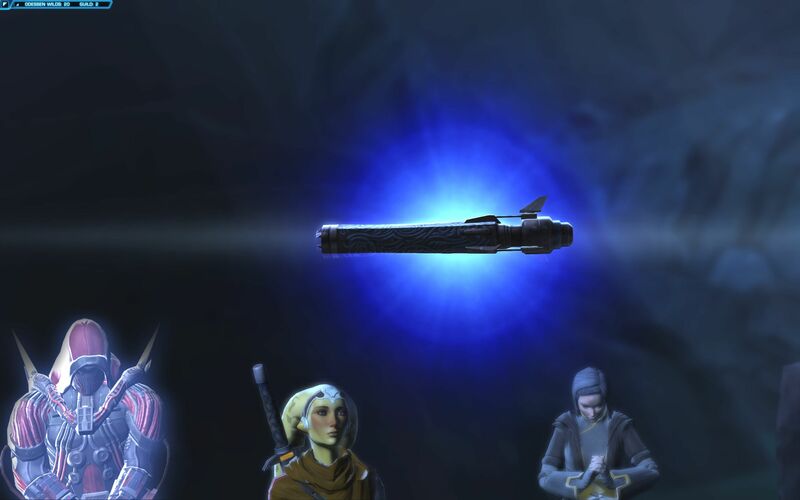 In a welcome break from the many missions on Zakuul, Knights of the Fallen Empire (KotFE) shifts its focus back to Odessen, the heart of your Alliance against the Eternal Empire. 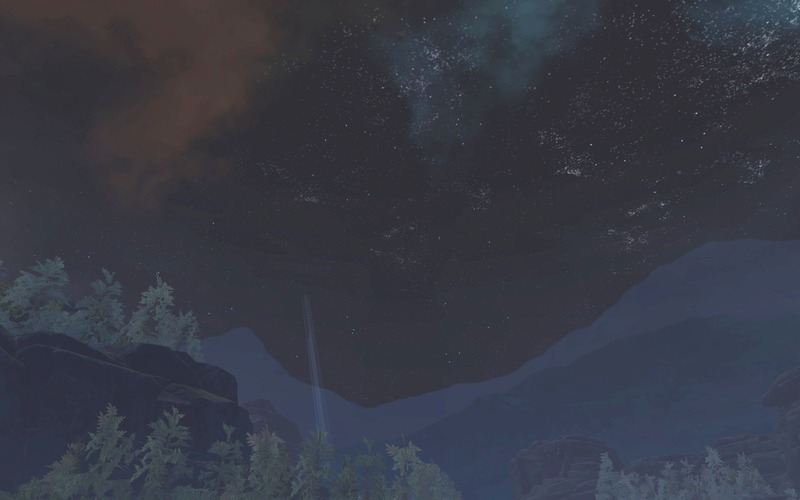 As this mission has an obvious flow to it, instead of doing a ‘walkthrough’ I’m going to write about some of the interesting aspects of KotFE Chapter 12: Visions in the Dark. I think this Chapter is a strong contender for best one so far in the Fallen Empire series, so a hats-off to the team at SWTOR! At the end of Chapter 11 – Disavowed, we learn that the Eternal Throne is the only source of the ‘GEMINI Frequency’, the channel which controls the entire Eternal Fleet. At the start of Chapter 12, you are given a choice about how to attack it: Do you send Kaliyo (from Anarchy in Paradise) infiltrate the power plant thousands of feet underground in an attempt to slice and control it? Or do you send in Aric Jorgan and Havoc Squad to destroy it and cut off communications between Arcann and the Fleet? Either way a diversion needs to be created to distract the enemy from your true goal. 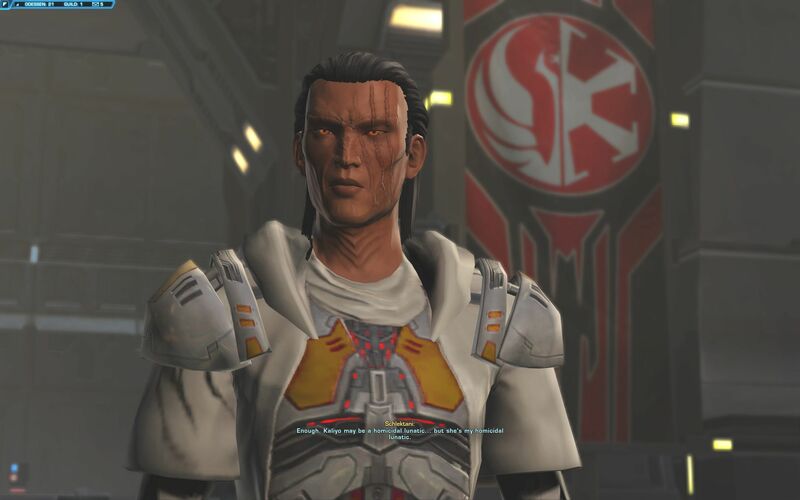 No matter which option you choose Koth and Senya will oppose you: sending Kalyio on the mission means bombing their home world. Sending Havoc Squad in means leaving Kaliyo to create a diversion, which carries the risk of injuring or killing civilians. For once, Koth and Senya stand together against you. I’ve tried it both ways, do what you feel is right. SPOILER: As far as I can tell it makes no difference whether you send Kaliyo or Jorgan. I tried sending Kalyio in and stopping Jorgan when the mission looks in jeopardy. However he says “Not your call, you left your post”. So you can’t manipulate the outcome. I haven’t tried preventing Kaliyo if Havoc Squad go in first, but I’ve seen tweets of Dark Siders condemning Kaliyo to death for disobeying the order to not go in. I can’t confirm this yet, as I haven’t got a Darksider through this chapter yet. Kaliyo or Jorgan? Your choice. Lana is at pains to remind you that you cannot please everyone. As this story progresses this is becoming more and more apparent. But she advises you speak with Valkorion to get his advice. 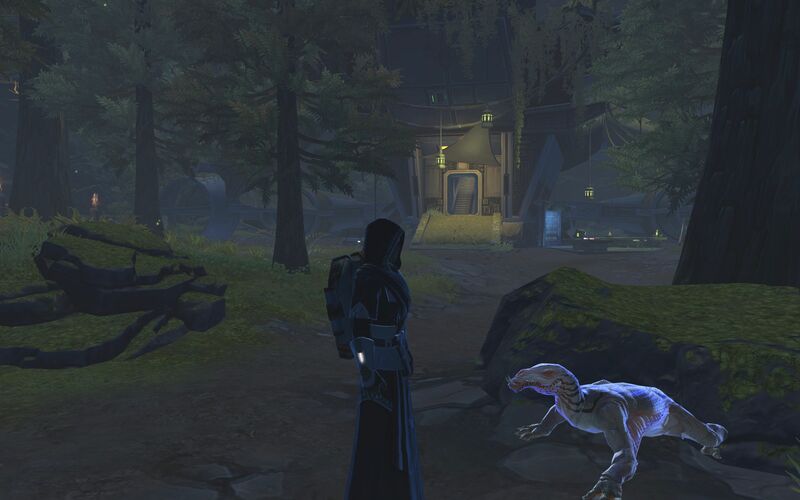 Kill 15 Shade Stalkers (Bonus Mission 1): a new creature to SWTOR, these creatures can be seen in the distance, then cloak themselves in the approach to you, before striking. If you have a strong ranged attack or Force Leap you may reduce the number that cloak. They do occasionally incapacitate you, so be warned. 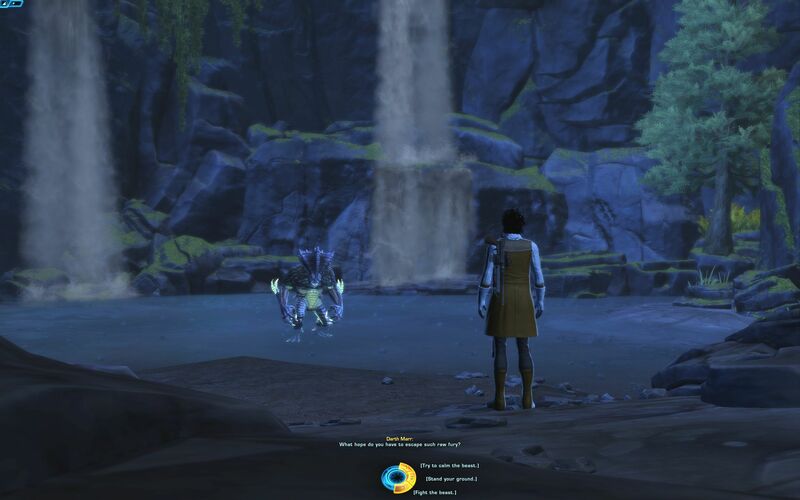 The Lost Holocrons of Odessen (Bonus Mission 2): this is the bonus mission. On my first run I failed to notice their approximate locations were on the map. Use the map and use the cairns to quickly reach those areas. As I still get people searching for this, I have pieced together a composite video showing where all the Lost Holocrons can be found. The Holocron locations are marked on your map, but hopefully this will help you locate them “on the ground” so to speak. Ensure your Temporary Ability Bar is not disabled! You will need it. In your bag you get two temporary abilities: a high grade shock absorber and a self-recharging med kit. Neither seem to self-recharge during combat, so watch that in Chapter 12’s two big encounters. For the first time in KotFE, the Immortal Emperor proves he does not need to work through you to demonstrate his power. He can fight on his own, and most interestingly, you can inflict damage on him – despite being a Force Ghost. If you keep your temporary shield and med kit working, you shouldn’t take too much damage. The challenge is ensuring you deal some. As of right now I’ve faced him with two Tanks and a Healer and those battles take ages! You don’t need to inflict more than about 20-25% damage to end the encounter. What is more interesting is what he has to say. Mastering the Light or the Dark Side is not enough to defeat Arcann. Once again you are challenged to evolve. You are ‘incomplete’ despite commanding the Gravestone, a multi-world Alliance and with his power. He claims to have protected you when Arcann struck you down: he says this whether you accepted his help in your previous fight with Arcann, or not. He says that the Galaxy is united under one banner, but it should have been your banner. There are a few creatures to tame. I chose a Sleen which has 48k HP. Then, after he finishes lecturing you, he makes a sudden announcement: he intends to leave your mind because he has “other matters to attend to”. Despite previously telling you that you and he are indivisible, he can move around as he pleases. We don’t know where he goes, or why. After that encounter, you find yourself in a camp, surrounding a downed Republic vessel (or part of one at least). 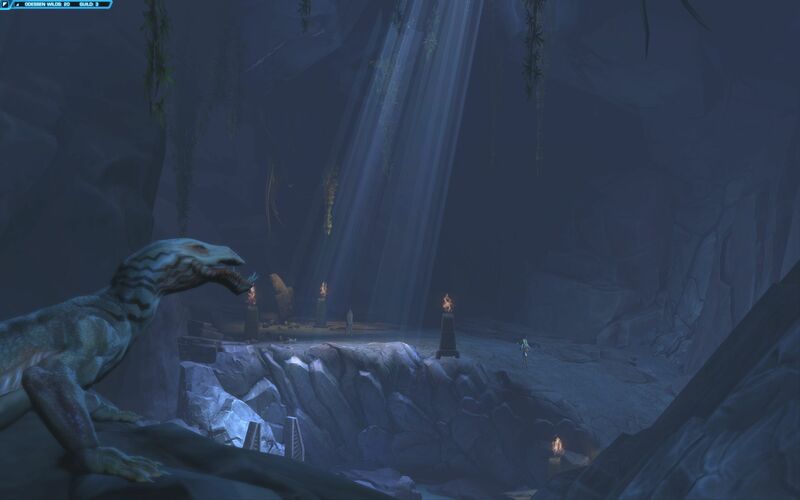 In the camp are various artifacts and writings: about the Jedi, the Sith, the Force and the Knights of Zakuul. 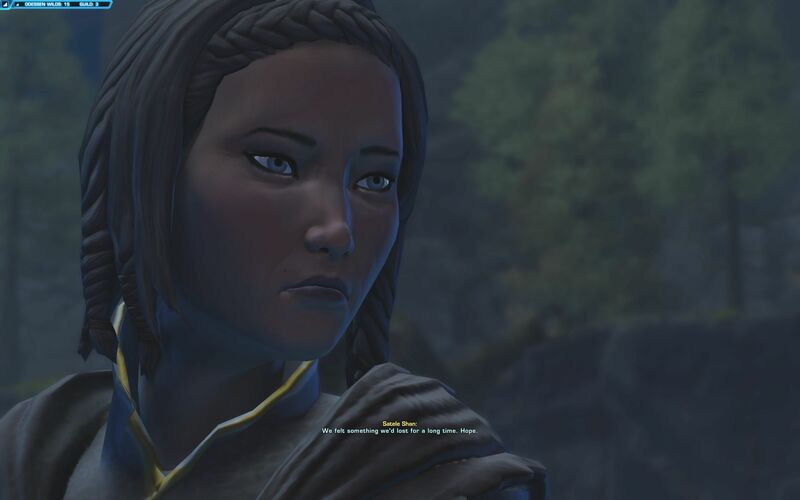 You discover this is none other that Satele Shan’s camp, where she has been waiting ‘for a long time’ to speak with you. Before I go into that, make sure you meditate at the circle of stones. It gives you the ability to tame ‘Young’ creatures in the phase. Doing so meant battling the Shade Stalkers was so much easier. From what I’ve seen they are currently invincible. I never saw their health decline (I may not have been watching closely enough though). Odessen and Zakuul are Perfectly Force-Balanced: As the Eternal Empire rose from a perfect balance of Light and Dark side, so should yours. There is Only the Force: Darth Marr admits, conceding part of the Jedi Code to be accurate. The Force is both Light and Dark, not one and the other. It is a paradox. 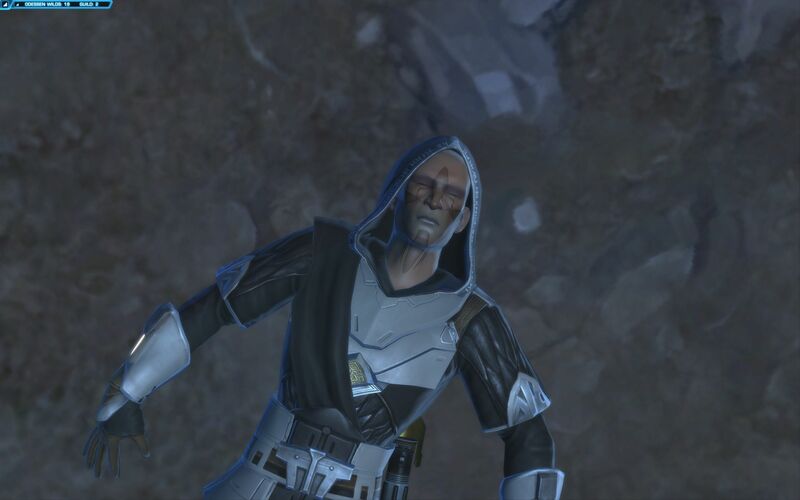 Arcann Cannot Control You: you are encouraged to strike from the place Arcann cannot see… within yourself. You must know what your Alliance stands for and you must stick to that. It goes back to a question I’ve asked before: What kind of Empire are you building? Defeating the Eternal Throne will take new Perspectives: and new weapons. 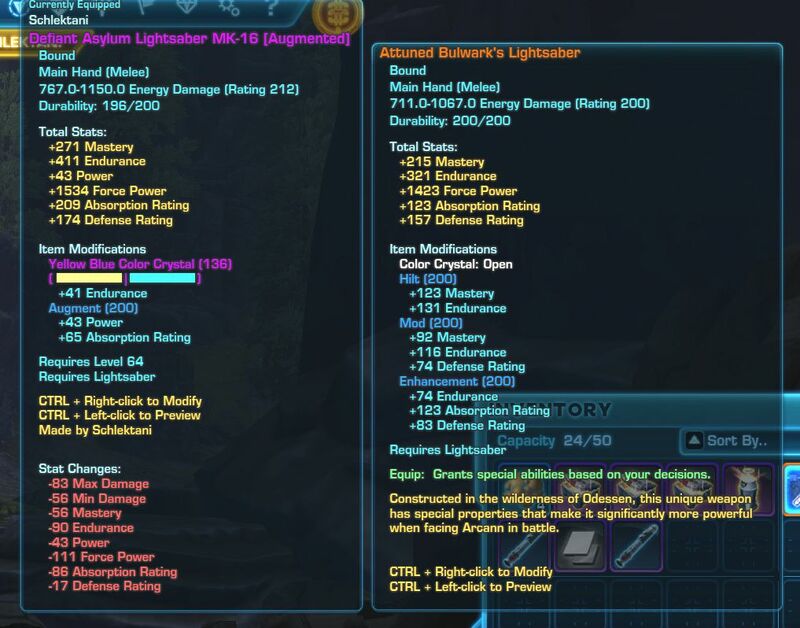 I’ve only done Force Sensitives so far, but a new Lightsaber had to be contructed (see below). Do You Accept the Challenge of Balance? much like the Shadow Jedi, will you accept balance in the Force, or fall back on ‘old’ teachings? Defeating Arcann Will Not Be Enough: Satele says the Throne and the Eternal Fleet are the greatest threat to the Galaxy. What will you do with them? You Must Take the Throne: Darth Marr says that any other outcome will lead to chaos, echoing a similar statement made by Valkorion in Chapter 2: A Dream of Empire. “Behind Arcann stands Vaylin and behind her many more”. You face a very-real vision of Vaylin. My first rule about Lightsaber duels is don’t get yourself into a corner. Sadly this whole fight takes place in a cave – a dead end! Keep moving, stay out of the red circles and keep your temporary bar protections active at all times. And be patient: you have to fully defeat her (unlike Valkorion earlier) and she takes some wearing down! Your new weapon grants special abilities based on your choices. As it’s only 200 Rated, you may want to mod this up a bit for stories or completely replace your current weapon. I suspect these additional buffs will matter in future chapters. How Should You Build Your New Chapter 12 Weapon? Most seem to take (as I have been doing!) the risk-averse route of drawing power from both. Your final test deals with the creature in the screenshot above. 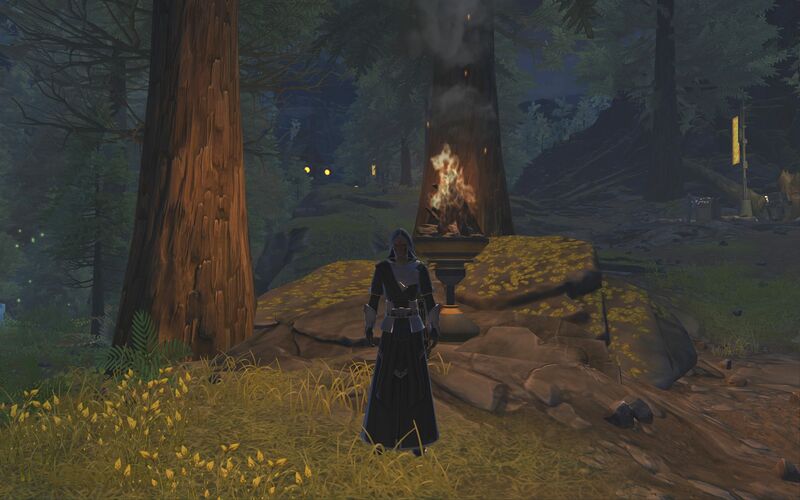 “How do you hope to escape just raw fury?”, Darth Marr asks. This creature is probably used as an Analogy of the Eternal Empire. Having been warned by Valkorion that if you don’t become something greater “You will feel the full weight of their rage”, you need to know how you intend to face Arcann, Vaylin and the Eternal Empire. So how will you react when you face your ultimate test: will you attempt to make peace, stand your ground and be unmovable, or strike with force? I don’t know what options you’ll get when that chapter lands at the end of season one. But even in the Scion Trials you are asked how you will react when Arcann is at your mercy (one of Heskel’s questions). But you are likely to get a choice, based on subtle messages throughout Fallen Empire. For some characters (I’ve only had the option on Darksiders if my memory serves me), you get the option to kill Satele Shan at the end of Chapter 12. I don’t know why you would do that, regardless of whether you’re light, dark or neutrally aligned. Maybe because she seriously considered killing you? A few people from my poll chose to do that. This will give BioWare some work for the forthcoming chapters as she will almost certainly become a Force Ghost like Darth Marr. But as my Dark Siders won’t kill her, I guess I’m unlikely to find out! I have also found that you can’t actually kill her as she escapes. Very odd though that in the same chapter you can’t flirt with Satele and try to kill her! Although questions have been asked of your character in previous chapters, in this one you are asked to look deeper into their very identity. Who are you really? What do you stand for? What is your goal in standing against Arcann? It is a challenging set of circumstances, forcing you to think and to fight alone. More choices and decisions are being asked of you: who to send into battle and with what objectives? Who do you want to please within your Alliance and who will you turn away? Visions in the Dark leaves you asking a lot of yourself! I’m looking forward to more deep thinking in future chapters, but for now, enjoy a few of my screenshots! Knocked out as a sign of Valkorion’s Favour? Uh-huh. Satele Shan: We felt something we’d lost for a long time. Hope. It seems that every class gets to forge a class-appropriate weapon for themselves. My trooper put together a new and mystical assault cannon. It was kind of awkward. I did like the chapter overall but it was kind of hard to swallow as a non-Force user. I don’t think enough thought has gone into the non-Forcies in KotFE. The Arcann/Heskel fights were really hard on my Sharpshooter due to their interrupts and faster movements. Although I have yet to do Chapter 12 on a non-Forcie, I think it will be weird for them to hear about balance in a power they either don’t care about, or in the very least, cannot wield. I did this chapter last night on my Commando, it actually did not bother me. she has pegged the Weird*Stuff**o-meter in her life that the Force stuff almost here-we-go-again. Yes that’s true, but it still takes a very long time to take that 20%, I found that true in Tank and Healer specs. DPS was much better, but that’s to be expected, I suppose. I also felt this was awkward for my trooper. I found myself actually getting angry that I wasn’t given dialogue choices to argue with them, lol! Not a force user, and my character doesn’t want the throne. It will be interesting going forward if my character can process all of this. Having chatted with a few others on Twitter – Trooper, Bounty Hunter and Smuggler are classes that particularly don’t lend themselves to being an aspiring ruler. I know I’ve had dialogue options to play down the Force (a bit like Han Solo’s “Hokey Religions and Ancient Weapons” comment) – but the Outlander doesn’t have any choice over their destiny, or so it seems. My Hunter chose the Solo life for a reason, so heading up a Military Alliance really doesn’t suit her!